Louise Magbunduku, a 21-year-old virtual technology and design student at the University of Idaho combines virtual technology with biology to study slime molds and their patterns of growth. The senior became intrigued by virtual technology after taking an “Artificial Life” course in fall 2017 from Assistant Professor Kyle Harrington in the College of Art and Architecture. She joined his research team as one of his assistants. Slime molds are a group of organisms that can live as single cells but can also work in tandem to be a multicellular structure. Her research documents the movement and behavioral strategies of these organisms, while advancing predictions of what slime molds can or will do. To visualize the growth of slime molds, Magbunduku takes repeated scans of dishes of slime mold to record the slime mold’s growth at different stages. An associated computer program compiles the images of each slime mold and tracks how the slime mold grows, even where the slime mold avoids growing. Using computer analyses, Magbunduku and her fellow researchers compiled all the information gathered from the scans and then fed the data through predictive computer models. The accuracy of the simulations relies heavily on the amount and precision of the information fed into the simulation, which means the more scans Harrington’s team takes, the better the growth models. As the models improve, scientists will be better able to predict the growth habits of slime molds. Magbunduku thinks the simulations produced by her research will advance researchers’ knowledge of slime molds, and the slime mold community will grow in conjunction with the increased availability of slime mold data. 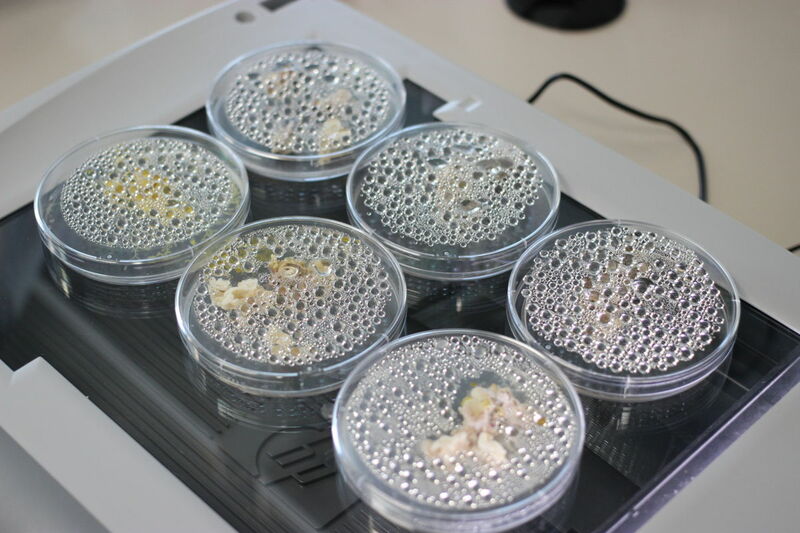 Although slime mold growth patterns are not a new topic, technological advancements such as scanners and compiling programs allow slime mold scientists to gather and process previously unattainable data about these hard-to-study organisms. “Another major bonus is that image analysis makes it easier to design future experiments,” Magbunduku said. Magbunduku thinks that, by participating in undergraduate research, she has gained unique experiences and skills in a collegiate lab environment. Petri dishes containing slime molds. Article and photos by Remington Jensen, a junior from Boise, Idaho, majoring in journalism. This project, “Managing Idaho’s Landscapes for Ecosystem Services,” was funded under the National Science Foundation EPSCoR under award No. 1301792. The total amount of federal funds for the project is $20 million, which amounts to 83% of the total cost of the project. The total amount of non-federal funds for the project is $4 million, which amounts to 17% of the total cost of the project.